Vascular skin conditions can have far-reaching consequences for those who have it; from red splotches across the face to unsightly red veins, vascular skin conditions can seem almost impervious to lifestyle changes or attempts to cover them up. Vascular skin conditions like Rosacea, spider veins, and telangiectasia are caused by abnormal blood vessels that dilate too easily, leading the skin to look perpetually flushed, or in some cases, develop dark patches or red veins that sprawl across the face and body. 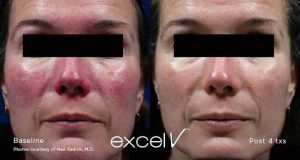 Renew MediSpa is proud to offer patients the Excel V, a revolutionary laser facial discoloration treatment that combines two different wavelengths of light to treat a large range of skin conditions. 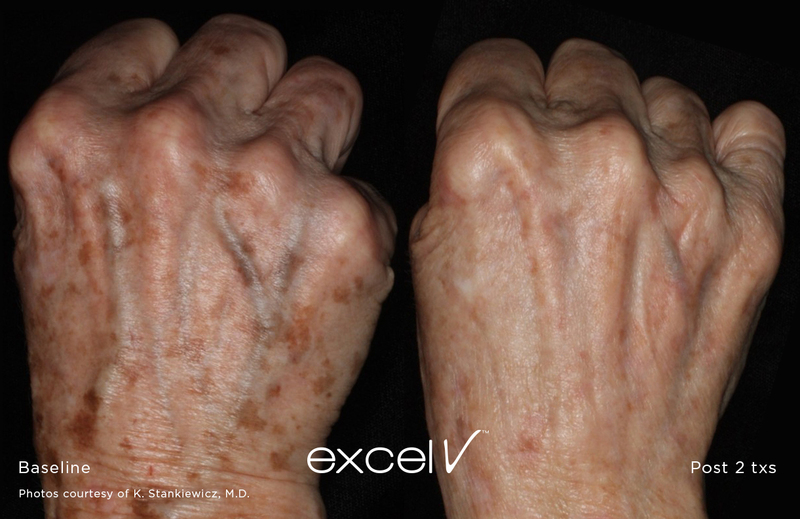 The Excel V is incredibly customizable, and it can work on a variety of skin tones and skin depths; more importantly, patients have the opportunity to treat multiple conditions with one device. Excel V’s long-pulse technology also makes it optimal for reaching abnormal blood vessels deep under our skin. With the Excel V, Renew MediSpa can offer patients clearer, flawless skin with a treatment that’s completely nonsurgical and requires no recovery period. Should I Be Treated with the Excel V? While some vascular skin diseases like port wine stains are present at birth, other conditions like rosacea appear once a patient is well into adulthood. Regardless of how they form, those who have them often suffer through years of emotional and psychological turmoil; it’s difficult to be confident or proud about your appearance with such visible facial flaws. Patients who are ready to treat these skin diseases and achieve smoother, clearer, and more luminous skin can benefit from the Excel V’s powerful results and lack of downtime. 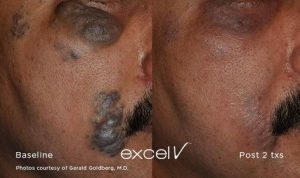 Of course, the Excel V can treat more than vascular skin diseases; the Excel V can treat patients seeking to reduce the appearance of pigment discolorations like sun spots and hyperpigmentation. The Excel V is also an excellent choice for treating small spider veins on the legs. It requires no downtime and there are no support stockings needed after the treatment. Excel V works by targeting the oxyhemoglobin in our blood vessels and the melanin pigments that make up the unsightly brown spots in our skin. This mechanism allows the Excel V to fire heat energy into the blood vessels, resulting in their collapse and absorption into the body. The heat energy also breaks up melanin into little pieces so that they could also be gradually absorbed by the body. 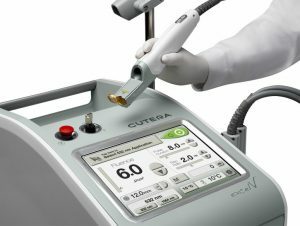 Despite the power and efficiency of its dual wavelengths, the Excel V happens to be one of the most comfortable laser treatments in the industry. The Excel V’s sapphire contact cooling hand piece protects the patient by providing cooling before, during, and even after the laser is fired. Depending on certain factors, the Excel V treatment should only take about 30 minutes to complete. Although most patients require multiple treatments, they will be able to see an improvement even after the first treatment. The number of treatments will depend on the patient’s skin type, skin quality, the size of the skin condition, and the color of the skin. While the Excel V requires no downtime, it’s recommended that patients avoid sun exposure for a week or two after their Excel V treatment. This common vascular skin disorder mainly affects facial skin. While it’s typically characterized by cosmetic symptoms like redness in the face, some patients also complain of heating and discomfort during rosacea flare ups. Rosacea can be triggered by exercise, extreme temperature changes, alcohol use, and spicy food. This condition occurs when tiny blood vessels in the face become permanently fixed in a dilated state. While telangiectasia is not a pressing medical concern, the fine red lines coursing through the face do look unsightly. These soft, compressible papules (skin mound) are most commonly found on sun-exposed areas like the borders of the lip, face, and ears. Venous lakes usually have a dark blue or purple color, and they’re usually about .2 cm to 1 cm in size. Dyschromia is an abnormal change in skin pigmentation caused by sun damage, inflammatory conditions like acne, or other triggers. This benign condition affects the sebaceous glands of adults middle-aged or older. These lesions can be solitary or appear in groups, and they appear as yellow, soft, papules on the nose, cheeks, and forehead. Leg veins can range from large, dilated veins, to small telangiectasias. Port wine stains are birthmarks that are stained red or purple. They often appear on the face and are made up of dilated capillary vessels. Port Wine Stains do not fade unless they are treated. Periorbital veins are the large, building veins that appear near the eyes. Combined with dark circles under the eyes, periorbital veins can make a patient look incredibly exhausted or old. Cherry angiomas are small red bumps that can suddenly appear on the skin. They typically affect people who are middle-aged and older, and they can spread. This common and benign skin condition makes the sides of the neck look red or brown. This condition mainly affects women, and it’s typically caused by sun exposure. Although this condition is mainly cosmetic, some patients report feeling itching and burning in the area. 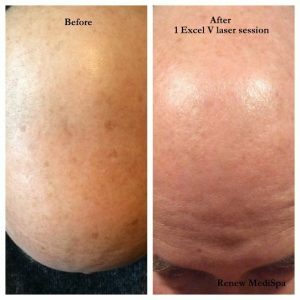 If you’re ready for a gentle yet powerful treatment for your vascular skin disease or brown spots, then the Excel V laser might be the treatment for you. To learn more about the Excel V, contact Renew MediSpa now for a consultation.